Is baby gaining enough weight? How to read a growth chart. Love and Breast Milk > The basics of breastfeeding > Is baby gaining enough weight? How to read a growth chart. Have you ever been told your baby isn’t gaining enough weight? If your baby isn’t gaining as much weight as the doctor or nurse thinks they should, it is easy to doubt yourself and your breast milk. But here’s the thing: most doctors and nurses were never properly trained in how to interpret a growth chart. Crazy, right? But the only professionals who truly focus on learning to interpret growth charts correctly are dietitians – and, of course, lactation consultants. So as a mom it is up to you to learn how to read your child’s growth chart, so that you can decide for yourself when it is time to start worrying. This post will explain in detail how a growth chart works and what you need to look out for. Why do we need to measure weight gain? Measuring weight gain is the best way we have of measuring whether a baby is getting enough breast milk. It’s not 100% accurate – as you’ll see in a moment – but it’s the best tool we have. At the very least, if your baby is gaining weight well, we can be pretty sure he’s getting enough milk, and if he’s not gaining enough weight, we know it’s time to start investigating. Similarly, the growth charts are the best tool that we have for deciding whether a certain amount of weight gain is “enough”, but they’re not the be-all and end-all of assessing a baby. So let’s start by looking at the weight itself, and then we’ll look at how the growth charts fit into the picture. Baby must always be weighed naked. Always. Otherwise, how do you know how much of that weight is the baby and how much is the clothes? And just so we’re clear on this, wearing a dry diaper is not naked. Clinics are very lazy to undress babies, because it takes more time (I know, I’ve worked in my fair share of baby clinics!) – but you should insist on it. Any weight taken with clothes on should be ignored, it’s that meaningless. You should only use a baby scale, and preferably an electronic one. My experience has taught me that most people do not use the mechanical (non-electronic) scales accurately enough to give you a meaningful reading. Using a bathroom scale intended for adults is out of the question, it isn’t nearly accurate enough. Only weights taken on the same set of scales can really be compared to each other. I’ve found as much as a kilogram (!!) difference between two scales in the same hospital on the same day! So always have baby weighed at the same place. If all those conditions are met, then you know you have a weight you can work with. So what does that weight mean? How do you know whether it’s good or bad? That’s where the growth chart comes in. Let’s start with what a growth chart is. Put simply, it’s a chart that was compiled by putting together on one page the weight gains measured from thousands of babies. It’s not so much a chart of how babies should grow as a record of how, on average, babies do grow. What the chart looks like depends a lot on which babies they used to compare the measurements – that’s why there are a number of different charts out there, and why it is so vitally important to use the right charts. 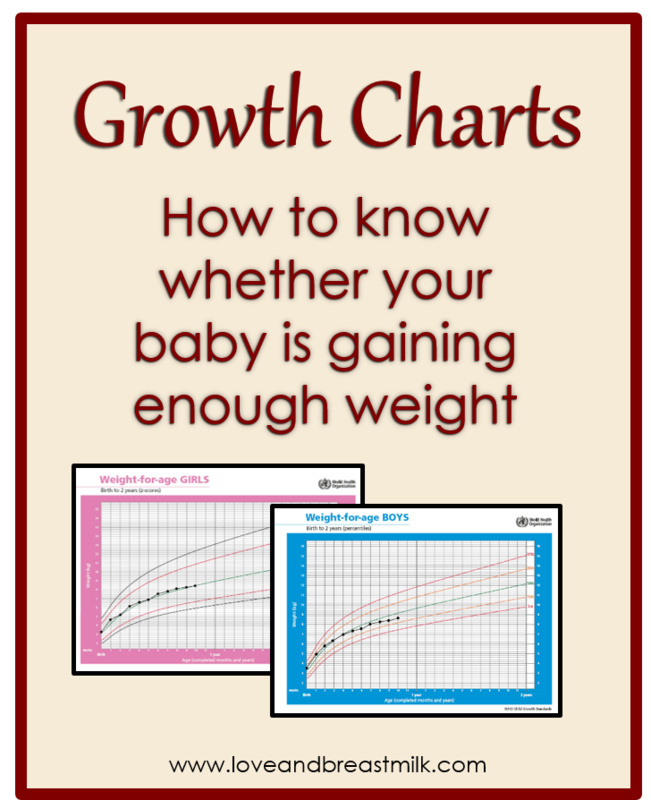 Without question, there is only one set of charts that can claim to show the way a baby “should” grow: the WHO growth charts. These charts were very carefully compiled using only healthy, exclusively breastfed babies from all the continents and all the major ethnic groups. (In contrast, the widely used CDC growth charts were compiled using mainly white, American, formula-fed babies. Until the WHO charts were published, the CDC charts were the accepted standard, so there’s a good chance your healthcare provider is still using them). You can access the WHO charts on the WHO website, here. 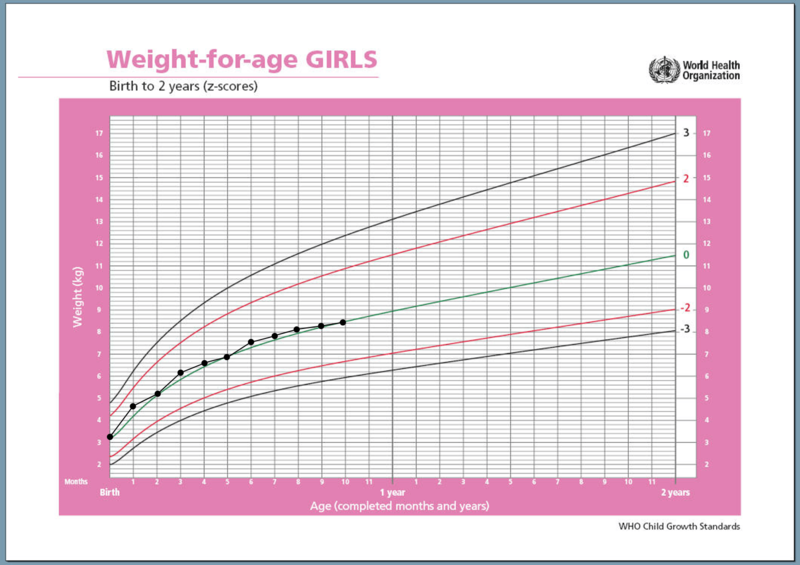 The South African Road to Health Booklet (the green or pink book your baby should have received at birth) was compiled using the WHO growth charts, so it is also a good one to use. 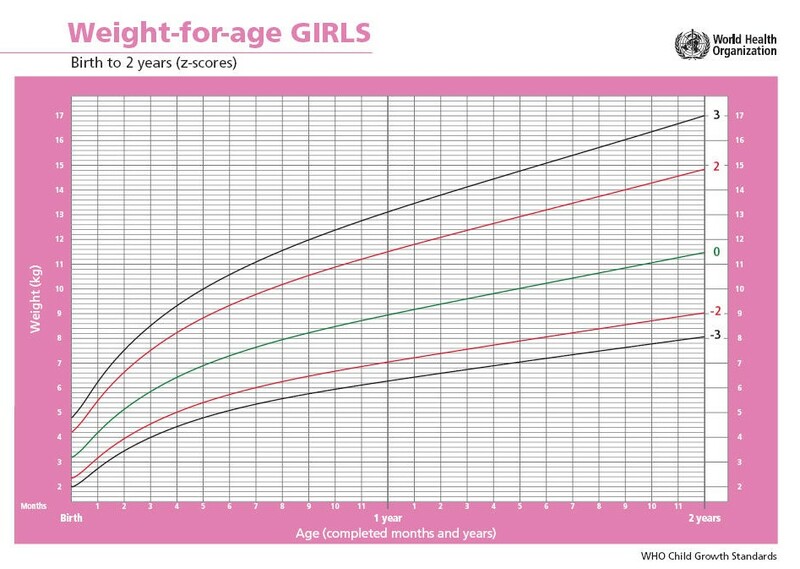 Here’s some pictures of one of the WHO growth charts for children 0-2 years – one for boys, marked in percentiles, and one for girls, marked in z-scores. Apart from the background colour, these are pretty much the same charts you’ll find in the Road to Health Booklet (those are marked in z-scores, by the way). The growth charts in the SA Road to Health booklet – same chart, different colours. There is endless confusion among healthcare providers about what those lines mean. Honestly, not one in 10 nurses or doctors understand them correctly. 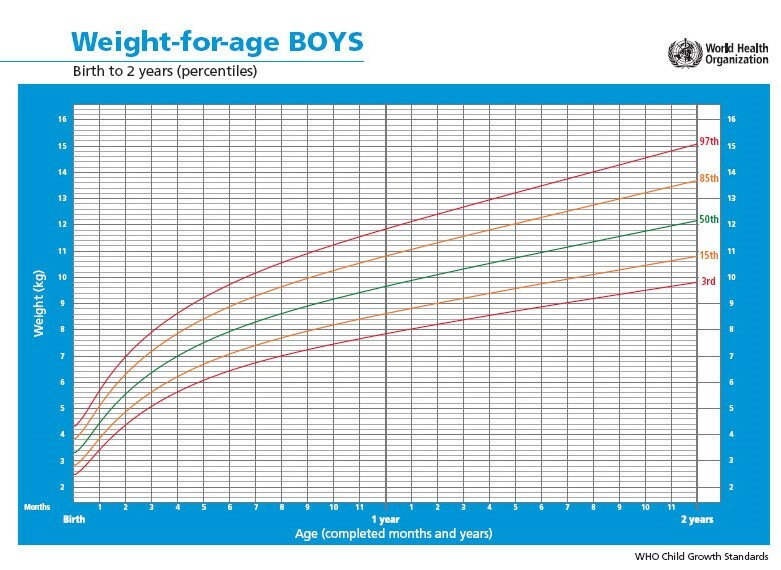 So let me explain to you, in short: The lines show more or less how quickly your baby should gain weight. That’s all. The green line in the middle (called the median, 0 z-score line or 50th percentile) is the source of a lot of confusion. All it is, is an average – just a statistical number that says “this is the middle of the normal range”. It is not a cut-off for a “normal” weight or a “goal” that all babies should aspire to. By definition, since the average is the middle of the normal range, half of all normal babies will be above it and half will be below it. So please, if your healthcare provider is panicking because your baby is below the green line, ignore them and read on. The red lines (the +2 and -2 z-scores) define the limits of the “mostly normal” zone. What this means is that if your baby’s weight moves to above the top red line or below the bottom one, we need to start investigating. It can be a sign that baby is getting underweight or overweight – but it can just as often be normal. You need two other pieces of information before making that call: baby’s height and the baby’s growth history (i.e. all the weights up to now). The height is used to check baby’s weigh-for-height on another chart; we’ll leave that alone for now. What I want to focus on is the growth pattern, because that will tell you most of what you need to know. Why is this so important? Because babies, like adults, come in different shapes and sizes. Insisting that all babies should grow on the green line is just as absurd as insisting that all adult females should weigh exactly 60kg. If, for example, a baby was born weighing 1,7 kg, she will always be below the curve – and that’s just fine! (In fact, research seems to indicate that overfeeding her to push her above the curve will result in poorer health and more chronic illness later in her life). Likewise, a 4,2 kg big boy will never be on the slim end of the curve. Where we go wrong is in thinking that the baby above the curve is automatically healthier than the one below it, but that’s absolute nonsense. But my baby isn’t following the curve! This is where it gets tricky. A baby that doesn’t grow parallel to the curves should be investigated, especially if there was a big change in the growth trajectory. Let’s deal with the easy one first: a baby that’s gaining weight too fast. If baby is still on breast milk only, it’s not an issue. My experience, and all the research we have available, shows that these babies revert to a more normal weight once they get mobile and start burning more calories; it’s really not necessary to restrict breastfeeding in any way. If your baby is already on solid foods, focus on healthy foods and stay away from the processed stuff; and if that doesn’t work, it may be a good idea to consult a dietitian. More worrying, and much more complex, is the baby that doesn’t gain enough weight. Breastfeeding promoters are quick to say “Oh it doesn’t matter, just as long as you keep breastfeeding on demand,” but I disagree. Slow weight gain may be normal or it may be a sign of a problem that can get a lot worse if not addressed. A baby that isn’t gaining any weight is pretty worrying, and one that’s losing weight even more so. 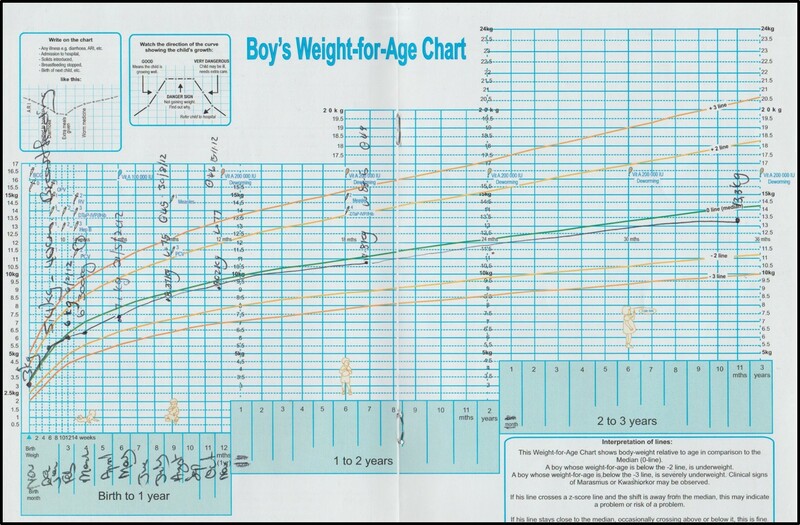 If your baby is gaining weight more slowly than the chart indicates, have a look at this post to see whether you need to worry. If, however, your baby’s weight is standing still or heading down, I very strongly suggest that you see a lactation consultant as soon as possible. I don’t want to be a scaremonger, but almost every case of severe malnutrition I’ve seen started out with a static weight or weight loss that was not addressed. Rather get it checked out. Weigh correctly: baby should be naked and weighed on a proper electronic scale, preferably the same one every time. Ignore the green line; it doesn’t tell you anything useful. If your baby’s growth curve is parallel to the curves printed on the chart, everything is okay – no matter how high or low that curve is on the chart! If your baby is not gaining weight well, check out this post, and get help from a professional who will support your efforts to continue breastfeeding! And that’s it; you now know enough about interpreting a growth chart to have an informed decision on your baby’s health. I hope this post has been helpful to you somehow, whether to reassure you or to alert you of a possible problem. And remember: if in doubt, ask a lactation consultant! I love to be associated as a Breastfeeding advocate.